Garlic Braised Chicken with Olive & Mushrooms! This recipe is a rendition of an original Martha Stewart recipe. We love her cooking style and love adding SALTOPIA's flare to her dishes! Heat a large straight-sided skillet (about 12 inches) over medium-high heat. While it's heating, season chicken with KISS & TELL sea salt. Add 1 tablespoon oil to pan and swirl. Add chicken, skin side down. Let brown, 5 to 6 minutes. Remove chicken from pan; set aside. Add 1 teaspoon oil to pan, followed by garlic and mushrooms; let brown, stirring occasionally, 5 to 6 minutes. Add wine to mushrooms and garlic and bring to a boil, then cook for 1 minute. Return chicken to pan. 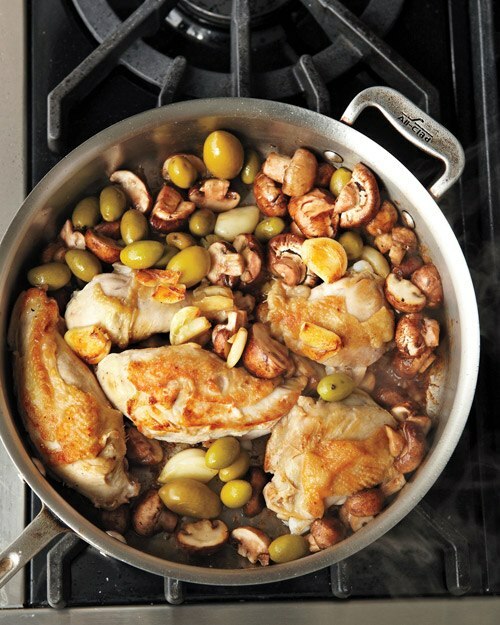 Add olives and chicken stock to pan; bring to a boil, then reduce heat. Cover; simmer until chicken is cooked through, 15 to 20 minutes.